Seeking a job, we all know is no easy task. What with the intense competition and spare few job opportunities on the grid, getting your job hunting game polished is a must. However, many of us, even the well experienced seekers find it hard to avoid certain basic mistakes which do no more than lower your chances of actually scoring that particular job. 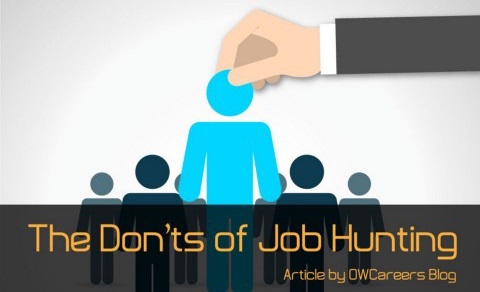 To ensure the same fate does not await your future, here are some worthy ground rules you should follow, to navigate these dangerous waters to make your dream job, a reality. It makes little sense why all the young job seekers attempt to perform this massive feat all by themselves. We hire mechanics to change our car’s oil, carpenters to do our wood work, so why not take professional help on this pressing issue as well. Trained career coaches aid in providing you the best job search advice, tactics on salary negotiations and other tips and tricks, here and there. Low cost options such as non-profit groups and university are available as well. Moving on, it is quite the trend to send unsolicited resumes to work institutes. Don’t do this. Your resume will most probably end up in the trash folder. Just as we don’t like adds popping up in between our chores, companies don’t particularly approve of unasked for resumes being stashed under their noses. Try a different approach. Opt forshowcasing your capabilities at the actual interview. You may not be hired for what you actually interviewed for, but companies are always in the need for employees with a unique set of skills to offer. Making them believe in their need for you, converts these ‘openings’ in to actual ‘opportunities’. Even talking of the very, rudimentary of tasks; the application for a job, it is strange how many candidates fail to read the basic requirements of the job application. Ensuring you communicate the necessary information, swept clean of any and every grammatical error is the first hurdle. Make it a point to thoroughly go through the steps provided, to eliminate any misunderstandings or overlooking any special tasks the hiring company may ask of you. Being too vague is a frequent mistake made by job searchers. Don’t allow yourself to be rattled by the entire range of positions on the market. Instead, narrow it down to what suits you best in terms of growth potential, satisfaction, payment possibilities, to fish out those jobs that click. Aiming for a more focused approach will help you avoid sidetracking into other less fruitful territory, likely to do no more than just waste your precious time. Once you get landed with the interview, the race is still not over. Presenting yourself efficiently to a company, well prepared to face every challenge they throw at you is the kind of attribute that will sail you your ship across. Many candidates make the fatal error of showing up unprepared on the critical day. Cutting it short, they are definitely not the ones lucky enough to get on that selection list. Practice before hand to gain leverage. Frequent redo before the big day will help you ace the whole thing. Last but definitely not the least piece of advice we have to offer, concerns your payment plan. Being newbies, it is hard to actually know what your skill set will earn you. Our advice is not to rush it. Look around, validate yourself as to what your net market worth really is. Once you have figured this out, underselling yourself is an error that will become obsolete. Our word of advice, is to try to get the employer to name the salary range before you set your demands on the table, putting you in a position to better negotiate your earnings. Considering all that said above, evidently, the obstacle course to your dream job may be riddled with some basic bumps and turns. However, conquering the position of your liking is not too difficult a task. Mistakes are basic human nature, but given the opportunity, the wiser contestant would do well to implement these suggestions in their job search routine. Yes, the job search is a treasure hunt we all have been on. Some of us do find valuable gems on the quest, the grand prize, however, awaits those who strive for it.